This drill teaches players facing full-court pressure and a trap, not to panic, to locate a receiver and make a good, crisp pass. Often the first pass after the in-bounds pass is the crucial pass in breaking the press, and is also the one often intercepted by the defense. This drill practices the in-bounds pass reception and the first pass up the court, either to the center on the ball-side sideline. And we can also use it to learn how to deal with the trap itself (see below). 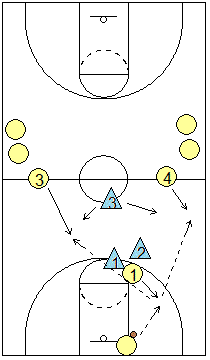 Use three lines for the offensive players (yellow). Use three defenders (assistants). Have two set the trap, after allowing the in-bounds pass. Have the third defender play the gap between the two offensive receivers and try to intercept the pass. You could use a manager or coach to make the in-bounds pass. The offensive O1 player receives the in-bounds pass. We teach our inbounds receiver to get into "triple-threat position" when receiving the pass, rather than just putting the head down and starting to dribble. We like to square up and face the trap, bent over in a basketball position, with the ball on hip away from the trap. We never want our trapped player to either stand straight up, or to hunch over and turn his/her back to the trap as in both cases, the defenders can simply close-in and tighten the trap. Instead, get into triple-threat, see the floor and your open teammate and make the pass. Or, aggressively attack an outside leg of one of the defenders. Sometimes, you can split the trap if the defenders are not "knee-to-knee"... here we teach our players to bend over, get low and strong like a football player going through the line with one low power dribble forward. In this drill, we immediately try to locate the open receiver and make the correct pass, with "zip". The passer should use an "air" pass if possible (as the bounce-pass is easier to intercept), and may need to use a head, shoulder or pass fake to free up a receiver. See also: Attacking the Full-Court Press. with Bruce Weber, head coach at Kansas State University, former University of Illinois Head Coach.